5 Bedroom End of Terrace House For Sale in Manchester for Guide Price £420,000. 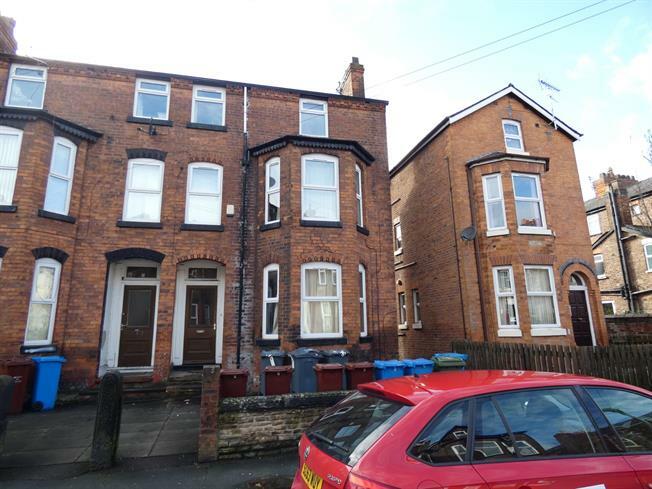 This five bedroom end terrace property is currently let out as a six bedroom HMO. Benefitting from gas central heating and uPVC double glazing throughout the property briefly comprises; entrance hallway, living room with bay window, dining room, shower room, utility room and fitted kitchen. To the first floor there are three double bedrooms and a family bathroom. To the second floor there are two further double bedrooms. The property also has a three chamber cellar and benefits from a front and rear yard. Wooden front double glazed door. Radiator, carpeted flooring, ceiling light. Double glazed uPVC bay window. Double radiator, carpeted flooring, ceiling light. Double glazed uPVC window with frosted glass. Radiator, tiled flooring, ceiling light. Low level WC, single enclosure shower. Double glazed uPVC window. Radiator, carpeted flooring, ceiling light. Roll top work surface, single sink. Wooden back , opening onto the terrace. Double glazed uPVC window. Radiator, laminate flooring, ceiling light. Roll top work surface, fitted units, single sink, electric oven, gas hob, overhead extractor. Double bedroom; double glazed bay window. Radiator, carpeted flooring, ceiling light. Double glazed uPVC window with frosted glass. Radiator, vinyl flooring, ceiling light. Low level WC, panelled bath with mixer tap, shower over bath, pedestal sink with mixer tap.